Our local toy store carries a large selection of these neat toys and my 3 year old can't get enough of looking at them every time we stop in. These are normally pricey, but at these prices I may be tempted to grab 1-2! 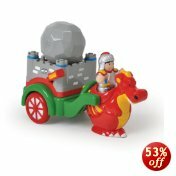 See the complete selection of 50% off or more WOW toys from Amazon here!